GRAND PRAIRIE, Texas (AP) — A gunman opened fire at a child’s birthday celebration at a Texas roller rink, killing five people, wounding four others and then killing himself as the private party turned to panic and some fled screaming in their skates, police and witnesses say. Authorities ascribed the gunman’s rampage to an apparent domestic dispute and said no young children or rink employees were killed during the shooting that erupted about 7 p.m. at Forum Roller World in Grand Prairie, about 20 miles west of Dallas. Some people at nearby businesses said they watched as adults and children spilled from the rink in horror. Authorities did not immediately release the victims’ names or ages or say how the gunman may have been related to those who died. Police said the gunman began arguing with a woman in Forum Roller World’s front area where the party was being held, although the rink was not open to the public because the family had rented it for several hours for the private party. Grand Prairie police spokesman John Brimmer said investigators were still trying to determine how many people were inside the building when the shots rang out. Police were called about 7:10 p.m. about reports of shots fired and some reports said officers entered with guns drawn, encountering the dead and wounded. Wounded survivors were taken to hospitals, and their conditions weren’t immediately disclosed. SEVEN people died and 30 were injured during a stampede outside a Brazzaville stadium where a pan-African musical festival opened, the Congolese culture minister announced. Jean Claude Gakosso said on Sunday that seven Congolese died as security forces failed to control a stampede outside the Felix Eboue stadium, the venue for the 8th Pan-African Music Festival (Fespam). Authorities cancelled the festival as a result. The Fespam was created in 1996 and is held every two years under the aegis of the African Union and in partnership with the International Centre of Bantu Civilisations, the International Music Council and UNESCO. The following site has a video of the stage collapse in Canada at a Cheap Trick show. 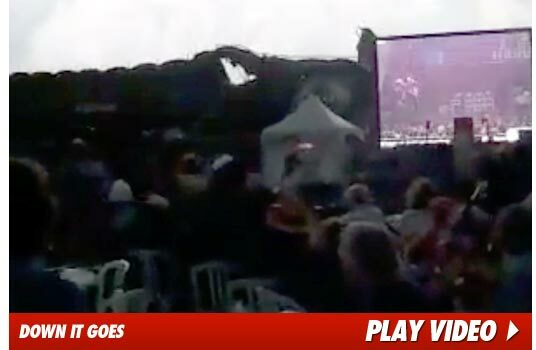 Several people were hospitalized when a severe thunderstorm hit a Cheap Trick concert in Canada Sunday — sending the stage crashing to the ground … moments after the band ended their set. Emergency vehicles rushed to the scene at the Ottawa Bluesfest — where one man was reportedly treated for life-threatening injuries. Local news outlets are saying part of the stage broke off and pierced the man’s stomach. Professional Fireworks Show Leaves 11 Injured in Central Wis.
ROME, Wis. — Eleven people including a firefighter were hurt in a fireworks accident in the central Wisconsin town of Rome. Rome Police Chief Adam Grosz said it happened about 9:30 p.m. Saturday during a professional fireworks show at Romano’s Pizzeria. Grosz said the initial investigation indicates a 5-inch tube malfunctioned and exploded on the ground, setting off several other fireworks and sending debris flying into the crowd. The police chief said 28-year-old Derek Bodette, of Wisconsin Rapids and 77-year-old Marlene Fuller, of Janesville, were flown to a hospital in Neenah where both were listed in stable condition. Bodette was on the crew running the fireworks display. A Rome firefighter was treated and released from a Wisconsin Rapids hospital. The Rome Police and Fire departments and Adams County Sheriff’s Department are investigating. The prestigious Montreux Jazz Festival in Switzerland came to a violent end over the weekend as crowds of drunken concertgoers clashed with event security. Police arrested 21 people, including two minors, over the course of Friday (15Jul11) and Saturday night (16Jul11) after they were allegedly caught launching bottles, rocks and chairs at security personnel. They were also accused of causing damage to a number of cars parked near the venue on the banks of Lake Geneva. The two-week festival drew to a close on Saturday and featured headlining performances from British rocker Sting and guitar great Carlos Santana. An estimated 250,000 people attend the top European jazz festival every year. In light of the recent tragic death of one of their fans, the Texas Rangers are re-evaluating their safety strategies and procedures. This is not the first person who fell over the railing. Last year in July another fan fell out of the club level while trying to catch a foul ball. The railings are 33 inches high where the current incident occurred and the building code dictates a railing at least 26 inches high. The Rangers have posted additional signage and are working with various entities to make the facility safer. After some review, the Rangers have decided to make all the rails in the stadium 42 inches. This will significantly impact safety, but it will be interesting seeing if it will make a differecne. I wonder if other stadiums and arenas will also try to make similar changes. It is always scary when people do almost anything to obtain a souvenir and that is both a part of baseball’s charm as well as serious threat to the safety of patrons. There is no easy answer and maybe the team will have to adopt some serious new rules or policies/procedures. The roof of Dutch Cup winners FC Twente’s De Grolsch Veste (“The Grolsch Fortress”) stadium partially collapsed during work to expand seating capacity, leaving one person dead and 15 others injured. Two support beams collapsed for unknown reasons as workers attempted to make what started as a 13,500-seat arena in 1998 into a 32,000-seat venue to accommodate the club’s recent success. In all, 16 people were injured when the roof at the southern end of the FC Twente stadium collapsed around midday, said Peter den Oudsten, mayor of the Dutch town of Enschede where the stadium is located. Three people were treated at the scene, he said. Two of hospitalized workers had serious injuries, Den Oudsten said, without elaborating. News video showed at least one construction worker, apparently bleeding from a head wound, being taken away by paramedics. Den Oudsten said sniffer dogs and cameras were being used to search for anybody else still trapped under the tangle of girders and red roof panels—the color of FC Twente’s shirts—behind the goal at the southern end of the Grolsch Veste stadium. ARLINGTON, Texas (AP)—A man attending a Texas Rangers game with his young son died after falling out of the stands and about 20 feet to the ground while trying to catch a baseball tossed his way Thursday night, the Rangers and Arlington fire officials said. Arlington Fire Department officials in a statement that another fan nearby tried unsuccessfully to grab the man to keep him from falling. They said the victim’s son did not fall. A very somber Ryan didn’t get into details about the accident or release the man’s name. Ronnie Hargis was sitting in the stands at Rangers Ballpark next to the victim. The men were talking to each other before the accident. TV replays showed the man falling head-first and landing behind a 14-foot-high wall supporting a video board for replays and scores. The area where the man fell is out of sight from the field. It is the second fatal fall at a MLB ballpark this season. In May, a 27-year-old man died after he fell about 20 feet and struck his head on concrete during the seventh inning of a Colorado Rockies game. Witnesses told police that the man had been trying to slide down a staircase railing at Coors Field and lost his balance during a game against the Arizona Diamondbacks. The accident in Texas occurred in the second inning after Oakland’s Conor Jackson(notes) hit a foul ball that ricocheted into left field. Josh Hamilton(notes), the reigning AL MVP, retrieved the ball and tossed it into the stands. Replays on Oakland’s television broadcast show the man reaching for the ball and apparently catching it before tumbling. The Rangers clubhouse was closed to reporters after the game. Replays on Oakland’s television broadcast show the man reaching for the ball and apparently catching it before falling. The visitor’s bullpen at the stadium is in left-center field. Athletics reliever Brad Ziegler(notes) was in tears after the game when he found out the man had died. There was an audible gasp in the stands when the man tumbled over the rail, eerily similar to an accident last July when a man fell about 30 feet from the second-deck of seats down the right-field line while trying to catch a foul ball. Before the Rangers batted in the second, manager Ron Washington spoke briefly with one of the umpires. Michael Young(notes), who was leading off the inning, could be seen talking to A’s catcher Kurt Suzuki(notes) and pointing toward the area where the previous accident happened. Former president George W. Bush was sitting in the front row with Ryan near the Rangers when the accident happened. Ryan left moments later while Bush remained in the seats. Ryan said the former president, who used to be the team’s managing general partner and is a frequent visitor to Rangers games, was aware of what was happening. Hargis’ daughter said the victim’s head was bleeding badly. Safawna Dunn, who was sitting behind the victim, said he appeared to have injuries to both arms and was conscious when taken away on a stretcher. “Josh Hamilton tried to throw (the ball) up to the guy because they were yelling for the ball,” Dunn said. Last July at Rangers Ballpark, a fan fell 30 feet from the second deck of seats at Rangers Ballpark while trying to catch a foul ball. That fan, Tyler Morris, suffered a fractured skull and sprained ankle. After Morris was hurt last year, he called the incident a “100 percent, total accident that could have happened to anybody.” He said he didn’t blame the Rangers or the ballpark. Ryan said it was too early to talk the two accidents and what evaluations the team might make about railings at the stadium. AP freelance writer Ken Sins contributed to this report.